Wan Smolbag Theatre takes its name from ‘one small bag’ in Bislama, the South Pacific nation’s lingua franca. “It stems from our idea in the beginning to show that theatre could be made from what you could carry in a small suitcase,” says artistic director Peter Walker. And for a nation spread across 70 islands, that’s a handy ethic. “Obviously, we have to choose between being an ‘in-out, do a show’ kind of group or working with individual communities and islands in a more detailed way over a longer period,” adds Walker. And so the latter course was duly chosen. Walker, who did an East 15 postgraduate course in 1981, started the company in 1989 with partner Jo Dorras. Now, 30 years on, it is the South Pacific’s only full-time theatre group in which all the actors are Pacific Islanders. Based in the capital and largest town Port Vila, Wan Smolbag is also the biggest local NGO in Vanuatu. It employs more than 100 people, 40 of whom work in theatre and film, and runs other services, such as clinics, a nutrition centre and youth centres with a thriving hip hop scene. Theatre led to film-making in the mid-1990s, which brought a Pacific-wide audience. 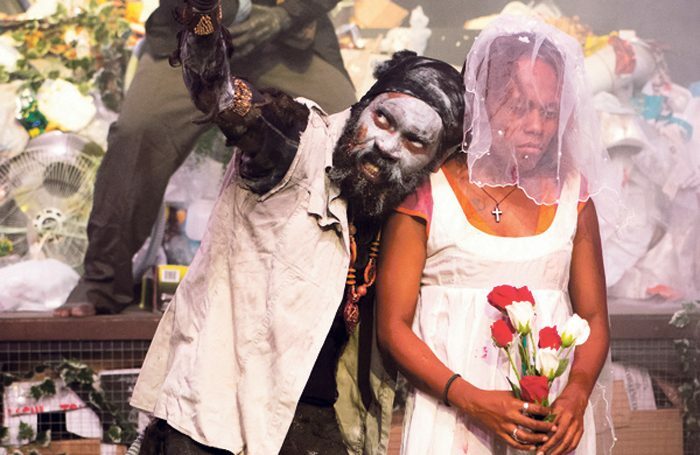 For its 30th-anniversary season, Wan Smolbag is producing a play with 60 volunteer actors with some of the main group, all set in the main Port Vila market. Also participating is UK director Laurie Sansom, artistic director of Northern Broadsides, who has already made two visits to run workshops. This year, Sansom arrives in April to devise a play with the group for six weeks. When performed, the work will be joined by several of the group’s plays from May through to July including last year’s Heart Problem. Meanwhile, there are plans for visits from New Zealand’s The Musical Island Boys and Australia’s Djuki Mala. How does training work? “Basically by doing. Over the years we’ve had occasional workshops with people from overseas in different performance styles such as forum theatre and puppetry, but the whole year is spent acting in plays from January to July and film from August to November – the dry season,” says Walker. “Some actors have been with the group for more than 20 years and as there are no other professional groups most are loath to leave. They have become very experienced actors. Given that half the country is under the age of 20, we do take on new actors every three or four years. In recent years they have come through the youth centre drama club, which does a production every year, usually featuring 30 or so young people not in school who perform it for schools around Port Vila.